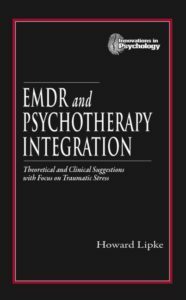 From the back cover: Recognizing the commonalities in human healing/growth traditions, EMDR and Psychotherapy Integration: Theoretical and Clinical Suggestions with Focus on Traumatic Stress offers therapeutic suggestions for use of EMDR that rely on the wisdom of previously established psychotherapies as well as that of religion and philosophy. While there is an emphasis on combat-related psychological problems, Dr. Lipke demonstrates how combat trauma and treatment contain the elements of a broad range of potentially traumatic events and the treatment of destructive stress reactions. Powell’s, Barnes and Noble, Amazon.com, and CompleteBook.com (government sales).